Botanically, they are the fruits from species of tree belonging to the family of Rosaceae,of Genus:Prunus. Scientific name: Prunus dulcis. 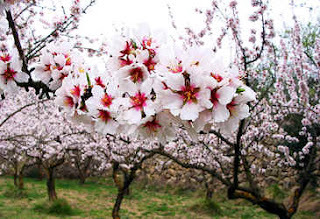 Unlike other flowering fruit trees that bear edible fruit, the almond tree’s kernel is the delicious nut found inside the fruit. 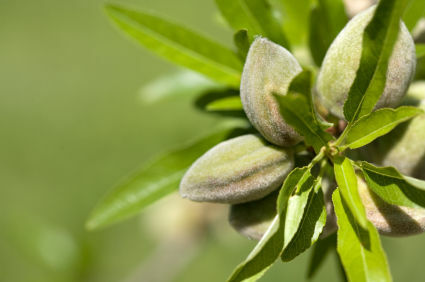 Almonds develop within a shell that is surrounded by a hull, similar to the fleshy part of a peach. 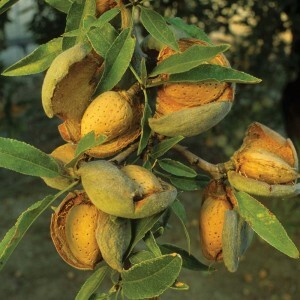 The almond hull protects the nuts from a variety of environmental conditions. It may come as a surprise how far back these delightful, little tree nuts go. While their exact ancestry is unknown, almonds are believed to have originated in China and Central Asia. Later, they were introduced to the Mediterranean. Today, 80% of the world’s supply of almonds comes from California. The US is the largest market for almonds, with about 30% of the crop sold for domestic use. About 52% of all almonds produced go into retail products, 20% go to foodservice applications, and the remaining 28% is used for bulk sales and snacking. 70% of the almond crop is shipped internationally with Spain, Germany, Japan, China and India being the leading export markets. Whether you roast them, toast them, or chop them, it’s easy to make sure a handful of almonds make it into your next meal or snack. After all, you can find them almost anywhere. § Almond nuts are rich in dietary fiber, vitamins, and minerals and packed with numerous health promoting phyto-chemicals; the kind of well-balanced food ensure protection against diseases and cancers. § These nuts are rich source of energy and nutrients. They are especially, rich in mono-unsaturated fatty acids like oleicand palmitoleic acids that help to lower LDLor "bad cholesterol" and increase HDL or "good cholesterol." Research studies suggest that Mediterranean diet, which is rich in monounsaturated fatty acids helps to prevent coronary artery disease and strokes by favoring healthy blood lipid profile. § The nuts are an excellent source of vitamin E; contain about 25 g per100 g (about 170% of RDA). Vitamin E is a powerful lipid soluble antioxidant, required for maintaining the integrity of cell membrane of mucus membranes and skin by protecting it from harmful oxygen free radicals. § Almonds are free ingluten and therefore, are a popular ingredient in the preparation of gluten free food formulas. Such formula preparations are in fact healthy alternatives in people with wheat food allergy and celiac disease. § These nuts are packed with many important B-complex groups of vitamins such as riboflavin, niacin, thiamin, pantothenic acid, vitamin B-6, and folates. These vitamins functions as co-factors for enzymes during cellular substrate metabolism. § They are also rich source of minerals like manganese, potassium, calcium, iron, magnesium, zinc, and selenium. § The sweet almond oil is obtained from the nuts is an excellent emollient; helps to keep skin well protected from dryness. It has also been used in cooking, and as“carrier or base oil” in traditional medicines in aromatherapy, in pharmaceutical and cosmetic industry. Amongst the different types of nuts, almonds are a great choice for keeping your bones healthy - one ounce/30 gram provide 9% of the recommended amount for calcium and 27% for magnesium. They are also a good source of zinc and very rich in vitamin E. Choose plain over roasted for maximum delivery of vitamin E.
In addition to their beneficial effects on lowering cholesterol and heart disease, almonds may help fight many cancers. This may be due to the many antioxidants flavonoids as well as amygdalin, which is better known as laetrile. 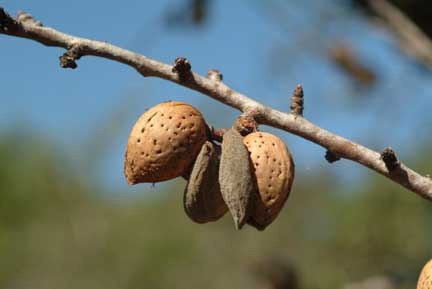 Of all the different types of nuts, laetrile is very rich in what's called 'bitter almond', which really is the apricot kernel. 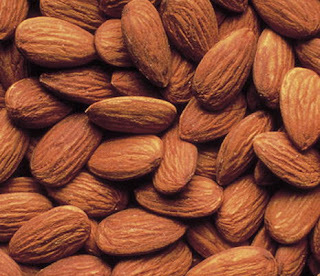 In an animal study of the effect of almonds on colon cancer, animal were exposed to colon cancer-causing agent and fed almond meal, almond oil, whole almonds or a control diet containing no almonds. The animals given whole almonds showed fewer signs of colon cancer, including fewer rapidly dividing cells. The almond's high fibre content - just 1/4 cup of almonds contain 4 grams of fibre - may have something to do with it. Among the nut family, almonds are one of the healthiest choices to add to your diet. 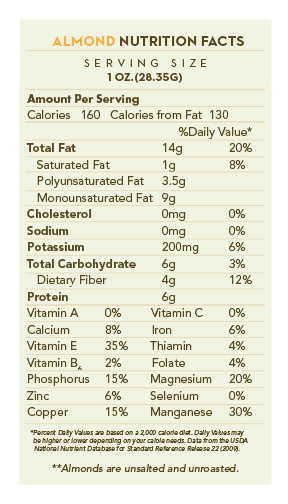 AskDrSears.com notes that almonds have 14 g of fat per 1-oz. serving, but that 90 percent of that is in the form of healthy unsaturated fat. Almonds contain about 166 calories per serving, as well as 5 g of protein and 4 g of fiber. Eating almonds will also supply several other important nutrients, including zinc, iron and vitamin E. Almonds also provide L-arginine, which may improve the flexibility of your arteries and prevent blood clots. An ounce of almonds provides 35 percent of vitamin E, according to University of Nebraska Cooperative Extension in Lancaster County. An ounce of almonds is about 20 almonds and provides 160 calories and 6 g of protein. Almonds may play a significant role in preventing insulin resistance and heart health, as shown in a 2008 study from Metabolism Journal. Study participants who supplemented their diet with almonds for one month had significant improvement in insulin secretion. Researchers also concluded that this may also provide reason long-term heart health associations with nuts. o Good for brain: Almond is a source of many nutrients which help in development of the brain. Almond induces high intellectual level and has been considered as an essential food item for growing children. Many mothers give almonds soaked in water to their children daily in the morning (2-3 pieces of soaked almonds are good enough, you can also remove the outer shell if it causes allergy to you. o Regulates cholesterol: Regular consumption of almonds helps to increase the level of high density lipoproteins (HDL) and reduce the level of low density lipoproteins (LDL), thereby effectively controlling cholesterol levels. LDL cholesterol is called bad cholesterol. o Good for heart: Mono-saturated fat, protein and potassium contained in almonds are good for the heart. Vitamin E acts as an antioxidant and reduces the risk of heart diseases. The presence of magnesium in almonds helps to avoid heart attacks. Almonds help reduce C-reactive protein which causes artery-damaging inflammation. Almond is also a source of folic acid. They therefore help to reduce the level of homocystein, which causes fatty plaque buildup in arteries. One avoids the risk of Alzheimer's disease by consuming almonds. But just like any other food, even almonds have their cons. They contain oxalates and excessive oxalates can cause crystallization. So people having kidney or gallbladder problems should avoid eating almonds. Almonds are healthy nuts loaded with lots of essential nutrients. Almonds eaten raw or fried, tastes good. It is an ingredient used in various snacks and sweets to enhance its nutritional value. There are various claims on health benefits of almonds. It is said almonds are beneficial for proper development of brain and for improved complexion as well as for healthy hair. There are various proven benefits of almonds in our daily life. It is the best natural fat burning food. Therefore it is used for losing weight naturally as it has good fiber content. In addition to this, more fiber content helps in proper digestion as well as increases energy level. We can also find various evidences of almonds health benefits in maintain cholesterol level. Munching of almonds instead of some unhealthy snacks helps in reducing excess fat accumulated around your waist. Another most essential almonds heath benefit is its tryptophan content which is very good for brain development. Having almonds will help you in relieving stress and controlling your mood swings making you feel good. Magnesium content in almonds helps in reducing risks of cardiac arrests. It increases HDL and helps in reducing LDL thereby controlling cholesterol level. Therefore it is most recommended for heart patients. Phosphorus content in almonds helps in developing brain and muscle tissues. Another most important health benefit of almonds is improvement of memory. Having 5 to 6 overnight soaked almonds in water or milk every morning will help in improving memory. Benefits of almonds are due to loads to vitamin content in it. Almonds are also rich in folic acid and vitamin B therefore when consumed during pregnancy it helps to reduce birth defects of fetus. Copper content helps in proper development of bone and improves nerve functioning. Almonds function as powerful antioxidants due to its Vitamin E content. It helps in improving blood circulation and lowering of cholesterol thereby providing added cardiac protection. Not only this, it helps to stabilize blood sugar as well. Therefore it can be the best snack for diabetic patients. One of the other significant health benefits of almonds are due to its laetrile content which serves as an anti cancer component. Benefits of almonds are also marked as to improve skin and hair texture. Vitamin B contents in almonds promote healthy growth of hair as well as nails. It also moisturizes skin therefore it is also used as natural scrub. Almond oil mixed with honey and lemon juice is used as face mask once in a week to improve skin texture. Almond oil is also used as skin moisturizer to make the skin glow. Almond oil is also a good hair conditioner and prevents hair fall, split ends and breakage as it moisturizes the scalp. Wild almonds are found in some places of world which contains glycoside that are converted into cyanide. To avoid its hazards, these wild almonds are good if roasted. People usually eat raw almonds and studies have also revealed various health benefits of almonds when its consumed raw. But, anything in excess always leads to problem; therefore consuming proper proportion of almonds in daily diet is advisable.